To help you to find walks near to where you live (as a resident or a holidaymaker) we have divided the Algarve region into three areas. Western Algarve covers the area from the west coast (Cape St Vincent in the south and Odeceixe at the northern extreme) across to Lagos. Central Algarve covers the area from Lagos across to Faro. Eastern Algarve covers the area from Faro to the Spanish Border at Vila Real de St Antonio in the south and up the Guadiana river past Alcoutim to the southern part of Alentejo. Clicking on an area of the map above will take you to pictures, maps and detailed information about walks in that area. To protect yourself against bites or stings wear stout shoes or walking boots, with socks, plus long trousers - the latter especially if you expect to walk through grassland or shrubby areas where there might be ticks. Ankle and leg cover also helps protect you against thorns (many of the plants of this region are very beautiful but also very thorny) and, although very unlikely, the risk of being bitten by a snake, a scorpion or a spider. As an added bonus, stinging nettles and other plants whose leaves can cause skin irritation are far less likely to cause you problems. Take sufficient drinking water with you, especially during periods when warm weather can be expected, as well as sun block and insect repellent. A hat can help you keep comfortable in sunny weather - the norm in the Algarve! Hunters are allowed to shoot in the countryside on Thursdays, Sundays and most Bank Holidays. While hunting appears to be in decline in the Algarve we still come across shooters. If you hear shots be aware that the hunters are looking for birds or animals to kill or maim, and so it's a good idea to retrace your steps. We do not let the existence of hunters prevent us from going out on days when they are likely to be in the countryside, but we do keep out of woodland and scrubland, instead walking in more open areas such as sea shores, coastal cliffs or grassland sites at such times. Also known as GR13, the Algarve Way is a long distance walking trail from Alcoutim on the Spanish border in the eastern Algarve across to the west coast at Aljezur and then southwards to Cape St Vincent, the most westerly point in Euriope. The Algarve Way is 255km (about 160 miles) long and takes ten to 14 days to cover at a fairly leisurely pace. Apart from on the final southwards stretch between Aljezur and Cape Sty Vincent, this trail is well away from the busy coastal strip and passes through a varied range of mainly hill and mountain habitats. Assisted by EU funding, the environmental group Almargem has created a waymarked route with the traditional red-white bars as waymarkers. Details of the trail, the project team, maps of each section of the route, and news updates are already on the Web and we will not duplicate them here. See www.viaalgarviana.org - the official (trilingual Portuguese, English, German) site of Associação Almargem – Project Via Algarviana. We also recommend that you take a look at www.algarveway.com which gives additional information and advises on variations to the official route. To most people the Algarve with its magnificent sandy beaches, hot and sunny summers and mild winters is a well known holiday destination. 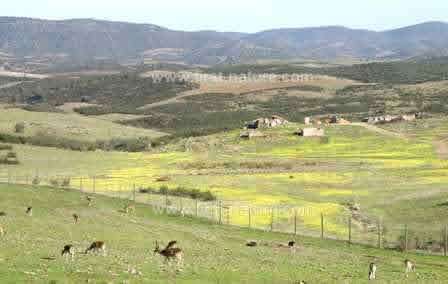 But there is another side to the Algarve which increasing numbers of people value and travel great distances to enjoy - its wonderful wildlife habitats. Away from the coastal hotspots is a seldom-seen Algarve - one of peaceful river valleys, woodlands bursting with birdsong and flower-filled meadows all teeming with plants, birds, animals, reptiles, moths, butterflies and other fascinating creatures. This website is a tribute to the wildlife of the Algarve and, we hope, a way of helping more visitors to see and enjoy the side of the Algarve which we have come to know and love above all others. At first glance the pace of urban development in the Algarve makes it seem an unlikely place in which to enjoy a wildlife holiday: the relentless spread of golf courses, hotels, villas and other thirsty developments puts enormous pressure on every natural resource, particularly water. It is not often that the casual visitor to the Algarve coastal region sees water flowing into the ocean from inland rivers. It is to be applauded, then, that the Portuguese government has set aside large areas of the most beautiful countryside and designated them as Natural Parks. These Natural Parks are excellent places to see some of the wildlife featured on this website, and they are all within easy reach of most visitors to the Algarve. 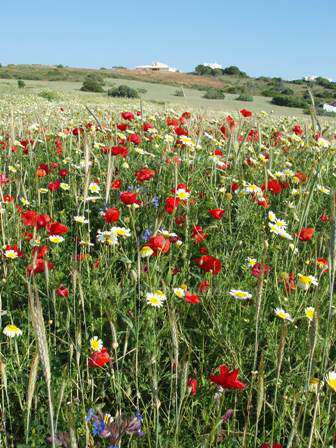 Ideal for beginners and experienced wildlife visitors alike, they are home to many of the iconic Mediterranean plant and animal species, both common and rare. Those who simply want to enjoy a drive or walk through outstanding scenery will not be disappointed, they are set in some of the most beautiful parts of the Algarve. Join us in celebrating the wonderful wildlife of the Algarve. As well as the major Natural Parks in the Algarve there are a number of other reserves or areas which are well worth a visit for those interested in wildlife. With the exception of one or two, they are not signed from roads and are often difficult to find, but amazingly word of mouth means that news circulates of good places to visit in order to enjoy more of the wonderful countryside and wildlife of the Algarve. If you know of a good site for seeing wildlife we would love to hear from you. If you would like to have your information included on this website we'll need clear directions to the start of the walk, a few details of what can be found there and what time of year it's best to visit the site. Digital pictures of the site or some of the wildlife species would be most welcome too.